Lit Review Anxiety? Use our step-by-step guide. Literature reviews can be tough. Whether you’re writing a standalone lit review or writing one to incorporate into a longer research article, they can be intimidating, time-consuming, and frustrating. 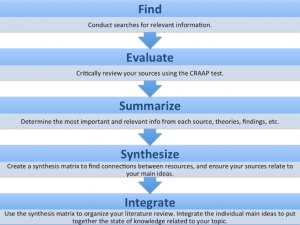 Each step of the process presents a new challenge: finding information, quickly evaluating it for its appropriateness for your research, summarizing each article, synthesizing your information, and integrating everything into a cohesive review. It’s quite the project! We can help. One of the biggest challenges is ensuring that your lit review isn’t simply an annotated bibliography with some well-worded transitions; synthesizing your information is key. We have a brand new guide that can take you through the process step by step, helping you write your best lit review yet. Use the templates and strategies in the guide to help you tackle your lit review, and don’t hesitate to ask your librarian for assistance at any point during the process. Can’t Find It? There’s a Guide for That.